Beginning from Windows Vista, Windows operating system creates and generates a preview thumbnail for almost every file which the file format is supported when the file is been viewed in Windows Explorer, regardless view type selected, including photos, pictures, videos, documents, etc. The Extra Large Icons, Large Icons, Medium Icons and Tiles view will show the thumbnails of the files, while Small Icons, List and Details view does not. However, when users open a folder in Windows Explorer, no matter which file view option selected, the system will start preview thumbnails generation process, with a green progress indicator sliding across the address bar to indicate the percentage completed. 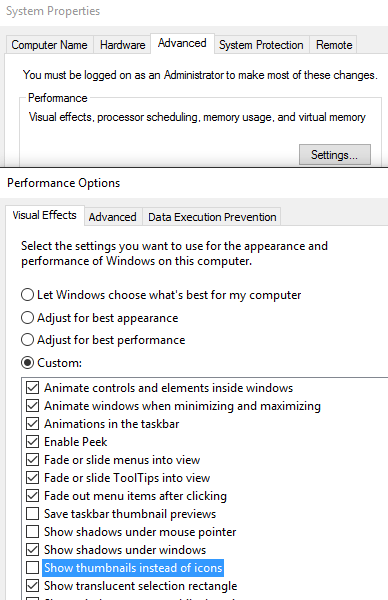 The creation of thumbnail for quick previewing of files or images in Explorer slows down the other file operations and severely affect overall computer performance, especially when on initial viewing of folder containing thousands of videos, movies, graphics, photos and other media, as Windows system will access each and every files to generate the thumbnails. Thus, by disabling the thumbnail previewing feature in Windows Explorer will speed up access to the folder and increase system response time especially when have to browse back and forth between multiple folders. 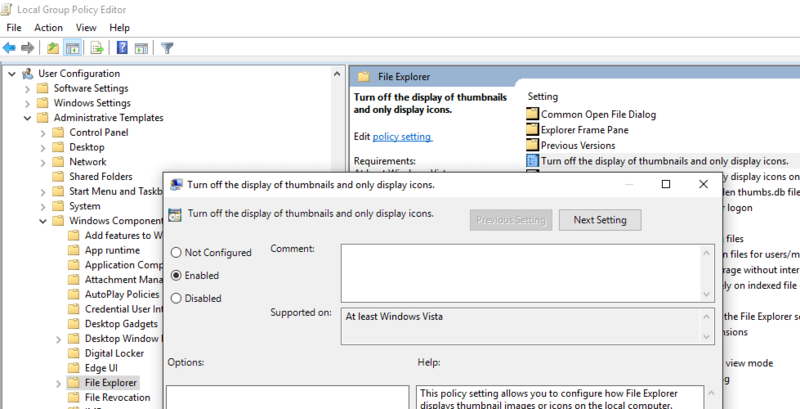 There are several ways to disable and turn off thumbnails preview in Windows, as listed below. Open Windows Explorer or File Explorer. In Windows Explorer window, click on Organize button on the menu bar (shortcut bar), then click on Folder and Search Options. In File Explorer window, click or tap on File on menu bar, and select Change folder and search options. Folder Options dialog window will appear. Click on View tab. Under the Files and Folders tree or Advanced heading, check (tick) the checkbox next to Always show icons, never thumbnails option. Go to Control Panel -> System and Security -> System. Click or tap on Advanced system settings on the left pane. In Advanced tab, click or tap on Settings button under the Performance section. Click or tap on OK. If Explorer is not found, create a new key under “Policies” and name it as such. If you choose registry key for “Current User”, change the IconsOnly DWORD (32-bit) Value to 1 (to show icons only – default is 0 which show thumbnails). If you choose registry key for “All User”, create a new DWORD (32-bit Value) named DisableThumbnails and set its value data to 1 (turn off thumbnails preview – default is 0 or non-existent which show thumbnails). This method is actually setting the registry key specified in method 3 option 2. Open Local Group Policy Editor (GPEdit.msc). Not all editions of Windows comes with Local Group Policy Editor. In the right pane, double click or double tap on Turn off the display of thumbnails and only display icons. Select Enabled to turn off the thumbnails previews in Windows Explorer or File Explorer. The Windows Explorer or File Explorer will no longer generate and create any thumbnail when viewing a folder in any type of views. This trick is especially useful for users who need to copy or move files between folders to perform the task faster. If you wish to re-enable and turn on the thumbnail preview in Windows Explorer or File Explorer, just follow the steps and reset the value to default setting.